Like much of the U.S., we’ve caught eclipse fever here at Quicken Loans. There’s a section of the U.S. that will be able to experience the eclipse in its full force with 100% sun coverage stretching from the top of the Northwest all the way down to the Southeast. Here in Detroit, we’ll see about 80% coverage of the sun at 2:27 p.m. Be sure to check the peak time in your area. 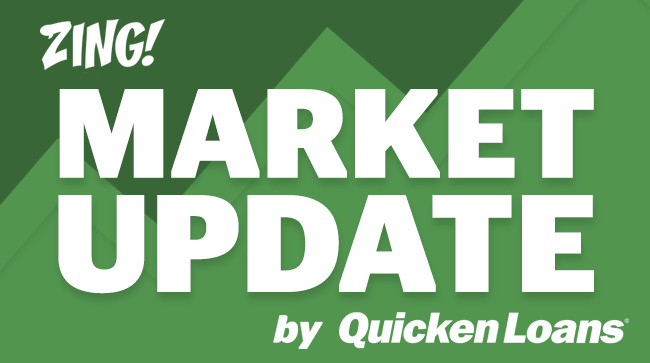 If you were paying attention to the market last week, it may have seemed like economic data was eclipsed by headlines around earnings and politics. Let’s jump right in. Retail Sales: Retail sales beat expectations, rising 0.6% for July. When cars and trucks were taken out, they rose 0.5%. This matches the number for when automobiles and gas were taken out. Numbers in June were also up 0.5% to 0.3%. May was unchanged after initially falling 0.1%. Nonstore retailers, vehicle sales and building materials were all up. Finally, a control group of categories was up 0.6%. Housing Market Index: Home builders are showing increased confidence in the future of the housing market. This index is up four points to 60 in August. The present sales metric was up four points to 74 and sales in the next six months are up five points to 78. On the downside, traffic of first-time home buyers going through homes appears to be down still, coming in at 49. MBA Mortgage Applications: Refinance applications were up 2.0%, while purchase applications were down 2.0% overall. The average rate on a 30-year fixed conforming mortgage fell two basis points to 4.12%. Housing Starts: Housing starts fell 5.0% to 1.155 million in July. The weakness was in multifamily starts, which fell to a seasonally adjusted annualized rate of 299,000, which are down 34% annually. Single-family starts were at 856,000, up 11% on the year. On the permit side, multifamily permits were down almost 10% to 412,000. Single-family construction permits are at 811,000, up 13% yearly. Jobless Claims: Initial jobless claims were down 12,000 to 232,000 last week. The four-week moving average was down 500 claims to 240,500. There was a 3,000-claim decline on the continuing claims side to 1.953 million. The four-week moving average of continuing claims fell 6,000 to about 1.960 million. Industrial Production: Production in July was up 0.2% while factory capacity remained at 76.7%, holding steady. With that being said, monthly manufacturing fell 0.1%. Analysts had expected a 0.2% gain. Motor vehicle production was a drag on manufacturing numbers, down 3.6%. Business equipment fell 0.5% and construction supplies were down 0.4%. Consumer goods, materials and nonindustrial supplies were up. Mining was up 0.4% and utilities were 1.6% higher. Consumer Sentiment: Consumer sentiment rose 4.2 points in initial August readings. The index was up to 97.6. There was an 8.5 point jump in expectations to 89.0. Current conditions numbers were down 3.4 points to 111.0. The report does note that the events in Charlottesville, Va. may not have been fully taken into account because of the timeframe when interviews were conducted, so that may impact the outlook for the future. The one-year inflation projection is at 2.6%, unchanged. The five-year outlook is down 0.1% to 2.5%. Fixed rates were down a bit last week. The Jackson Hole Economic Policy Symposium is next week. The market may move around a bit depending on some of the statements made there. If you’re in the market to buy or refinance, it’s a great time to lock your rate. This week, 30-year fixed-rate mortgages (FRMs) averaged 3.89% with an average 0.4 point for the week ending August 17, 2017, down from last week when they averaged 3.90%. A year ago at this time, 30-year FRMs averaged 3.43%. On the shorter-term side, 15-year FRMs this week averaged 3.16% with an average 0.5 point, down from last week when they averaged 3.18%. A year ago at this time, 15-year FRMs averaged 2.74%. Finally, 5-year Treasury-indexed hybrid adjustable rate mortgages (ARMs) averaged 3.16 % this week with an average 0.4 point, up from last week when they averaged 3.14%. A year ago at this time, 5-year ARMs averaged 2.76%. The market hasn’t been as high lately with business forces starting to wonder whether President Donald Trump will be able to deliver on his economic agenda. It was against this background that the market rebounded slightly on the news that top advisor Steve Bannon would be leaving the White House. The news wasn’t enough to head off losses on the day, with the Dow Jones industrial average falling 76.22 points to close at 21,674.51, down 0.84% on the week. The S&P 500 was down 0.65% since last Friday’s close after falling 4.46 points to 2,425.55. The Nasdaq closed at 6,216.53 Friday, down 0.64% on the week and falling 5.39 points on the day. FHFA House Price Index (9:00 a.m. ET) – The Federal Housing Finance Agency (FHFA) House Price Index (HPI) covers single-family housing using data provided by Fannie Mae and Freddie Mac. The HPI is derived from transactions involving conforming conventional mortgages purchased or securitized by Fannie Mae or Freddie Mac. New Home Sales (10:00 a.m. ET) – This measures the number of newly constructed homes with a committed sale during the month. Jobless Claims (8:30 a.m. ET) – New unemployment claims are compiled weekly to report the number of individuals filing for unemployment insurance for the first time. An increasing trend suggests a deteriorating labor market. The four-week moving average of new claims smooths out weekly volatility. Existing Home Sales (10:00 a.m. ET) – Existing Home Sales tallies the number of previously constructed homes, condominiums and co-ops in which a sale closed during the month. Existing homes (also known as home resales) account for a larger share of the market than new homes and indicate housing market trends. Durable Goods Orders (8:30 a.m. ET) – These are based on new orders placed with domestic manufacturers for factory hard goods. There’s not that much actual economic data, but we do get some home numbers and durable goods. If mortgage and economics don’t get you excited, I don’t blame you. We have plenty of home, money and lifestyle content to share with you if you subscribe to the Zing Blog below. If you’re going outside to see the eclipse today, make sure to check out our safety guide. Don’t look directly at the sun unless you have special protective lenses. Your sunglasses won’t help. Happy eclipse day!